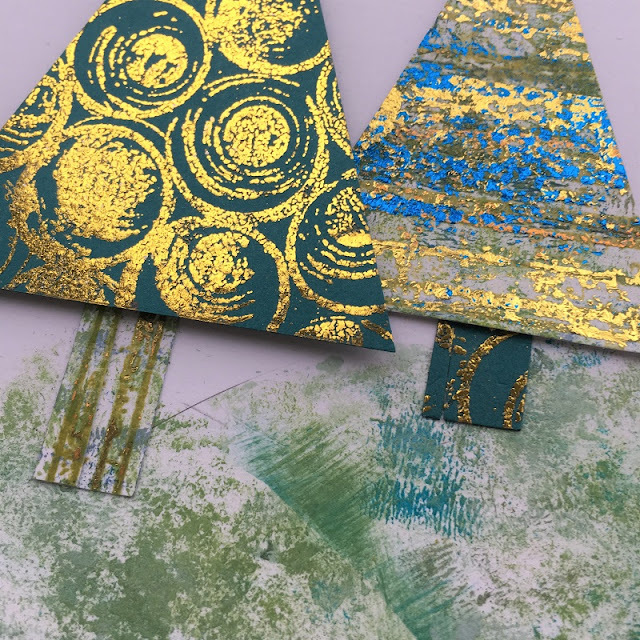 Hi everyone, it's Ruth here with you today, and I'd like to share with you a way of using some of Seth's fab new stamps with foiling to create some quick Christmas cards. I always like to get the most out of stamps sets and the grungy images and patterns of ESA09 work perfectly when embellished with a little foiling for a contemporary card. 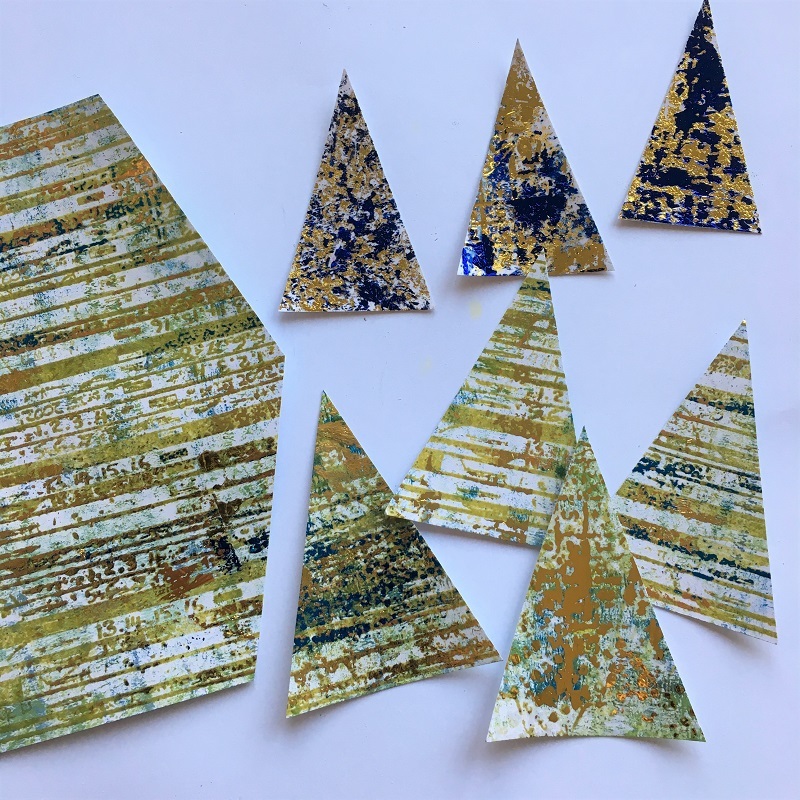 Simple triangles or box shapes work really well and while there is a theme to them each one is different, allowing you to be creative even when you're making a batch of them. I frequently add a touch of gold or metal to my projects but this topic allowed me to really indulge in my love of foiling and revisit a few techniques. I didn't think bright white smoothy card would work with a grungy colour palette but it was perfect. I used Fresco Acrylic paints to make lightly brayered or painted backgrounds and the colours were Blue Lagoon, Venice Blue, Twilight, Winter Green, Magic Moss, Sea Glass, Slimed and Cerise. I used both clear embossing powder and WOW bonding powder. I used clear when I only wanted to use touches of foiling. This is where the left over bits of foil come in to their own, when touches adhere to the hot melted powder. I use a bone folder or my finger wrapped in a cloth to rub over the area, it does get very hot. This linear design means you can repeat stamp it and I've used it horizontally for the body of the tree and vertically for the trunk. 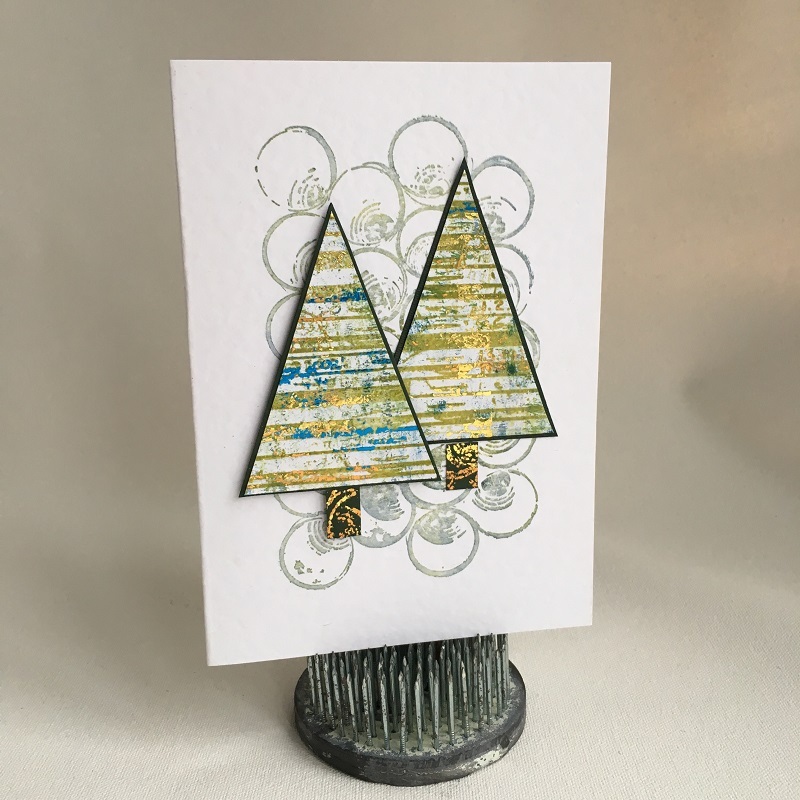 Lots of triangular trees to be made from a small piece of card. Lines and circles always complement each other, simple but effective. Slight change here to modern and bright and could even be used for a birthday card. I loved using the brightest paints I could find and the lines, circles and squares of the stamps make each present so individual. 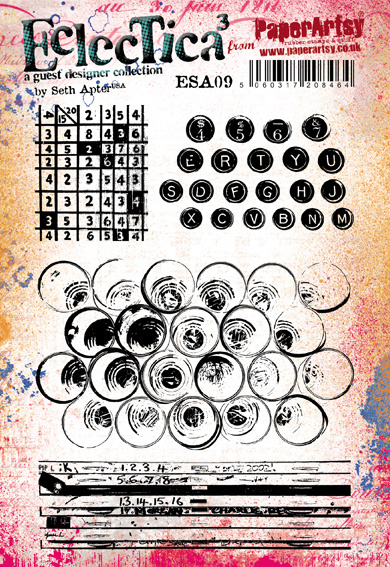 The background keyboard stamp is in Watering can archival to act as a 'foil' (sorry!) to the bright boxes. 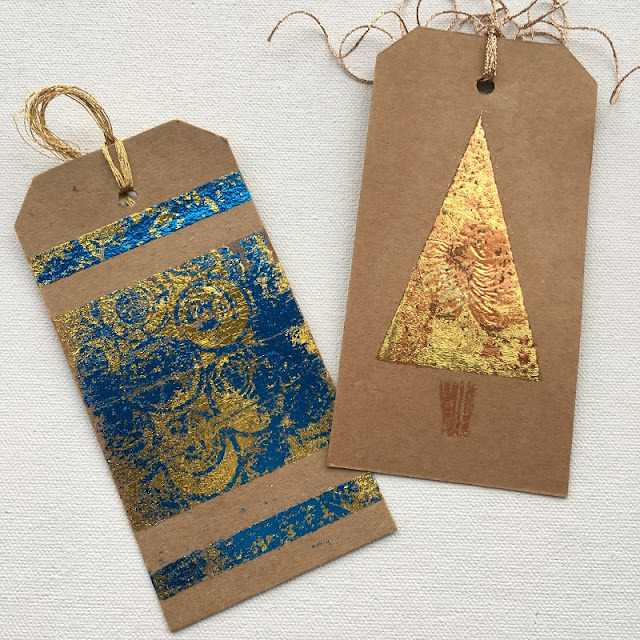 Kraft card tags and another technique. 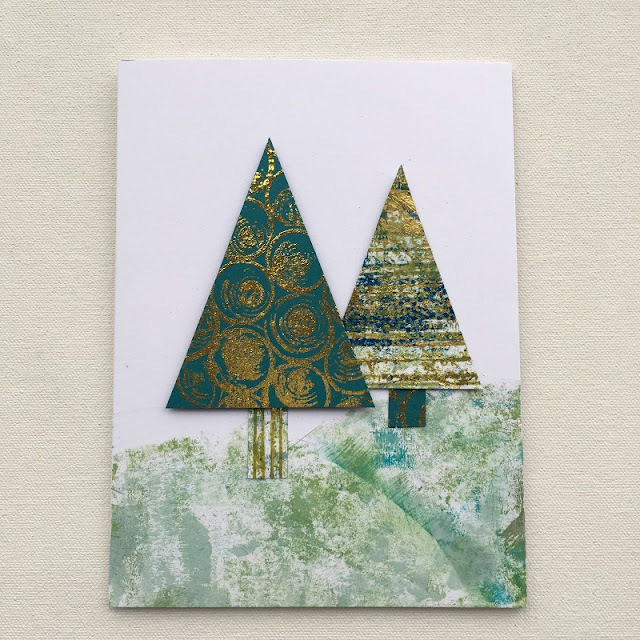 After using a fresh piece of foil on the teal tree of the large card (see below), I had a negative stamp impression left in the foil, so I used versamark on masked off sections of a tag and applied bonding powder. I then used the 'negative' gold foil over the area before reheating the remaining powder and using a contrasting colour, result...luscious! I love making painty backgrounds and this is simple brayering over masked-off circles to evoke muted frosty hills. 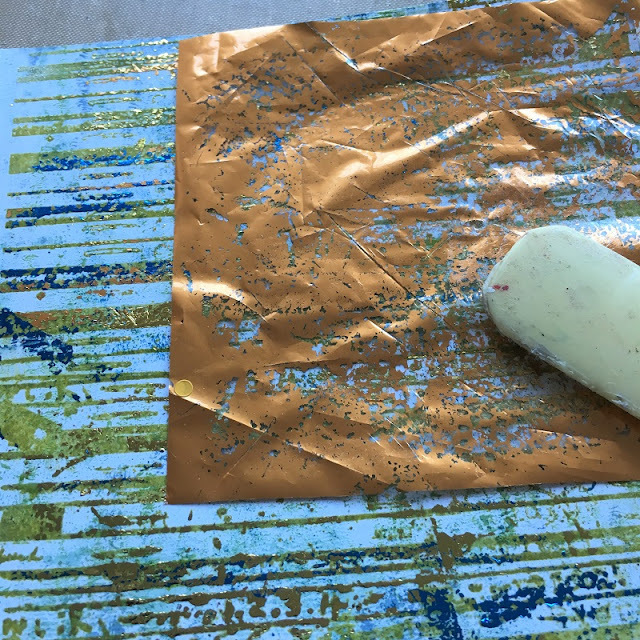 The bling of foil works beautifully against the chalkiness of fresco paints. 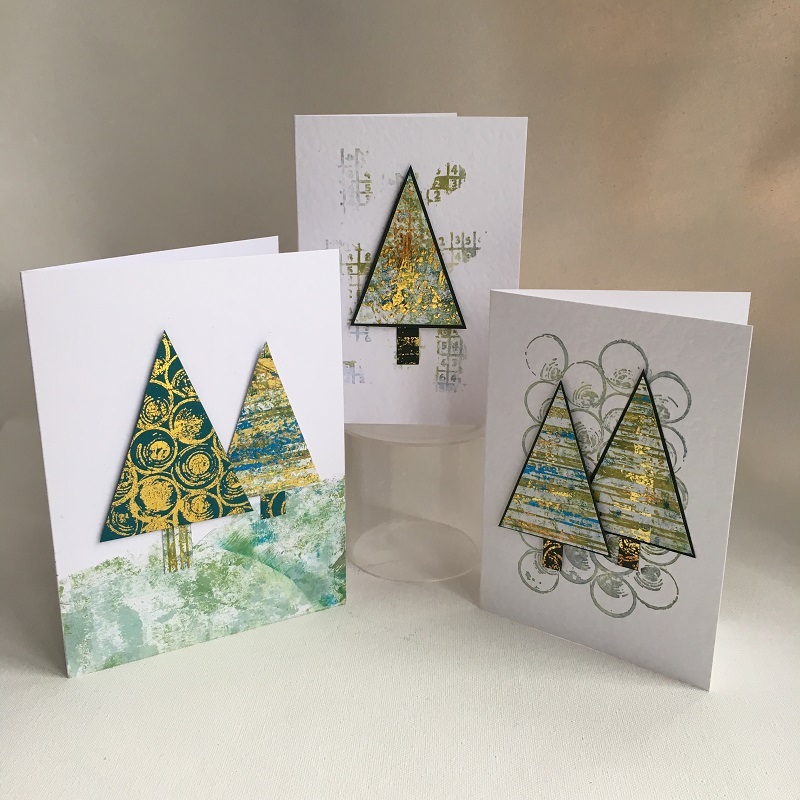 I didn't add a sentiment to any of the cards but my OH recognised them as Christmas cards straight away, which must be a good sign! I hope you'll be encouraged to think outside the box with your stamps as they can give a very contemporary twist to Christmas greetings. 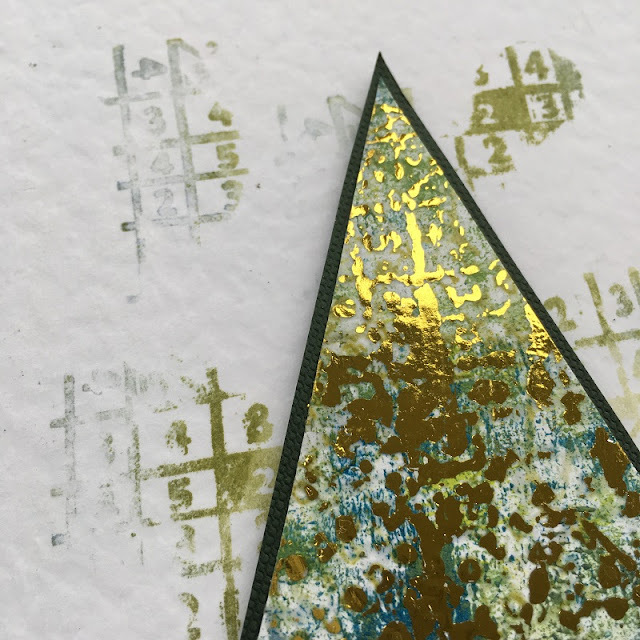 I also hope you'll have a go at foiling if you haven't already, there are lots of ways to add it, I've only shared a couple today and it is fun to see the transformation it can make. The current topic link Topic 20: Foiling will close 17:00 (London Time) Sunday, 25th November 2018, and the winner will be announced 2 hours later at 19:00. Please make sure we can contact you as a prize winner - it helps if you share your contact info from the platform you opt to use. Oh Ruth.... lovely creations. Simply wonderful! So many gorgeous effects, but your grungy trees are my favourites. What fabulous colour combinations, and Seth's squiggly circles look amazing. Love this, Ruth!!! 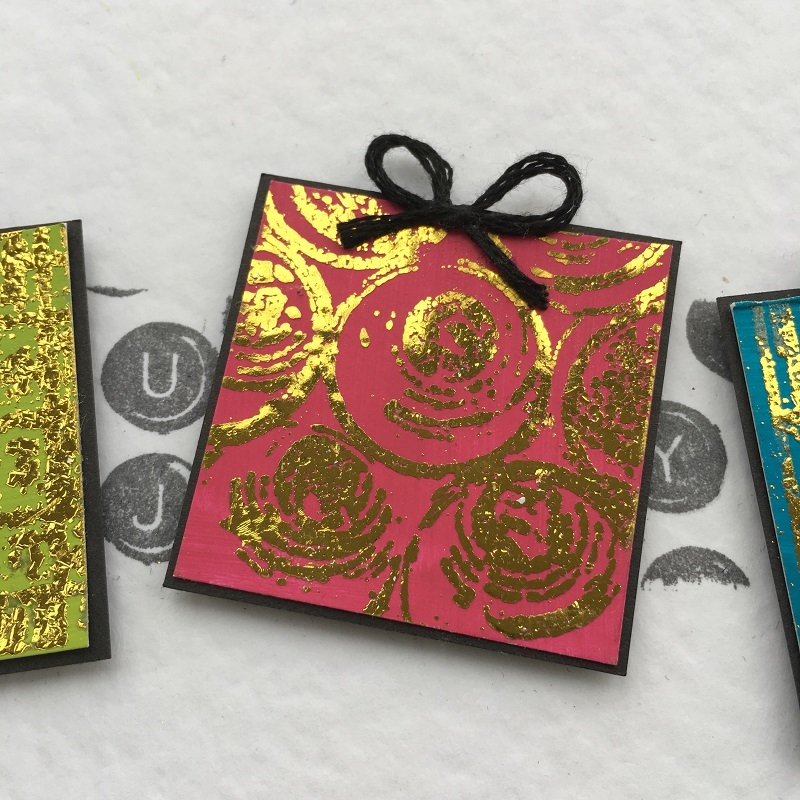 Fabulous cards!!!!!!! Fab cards Ruth. 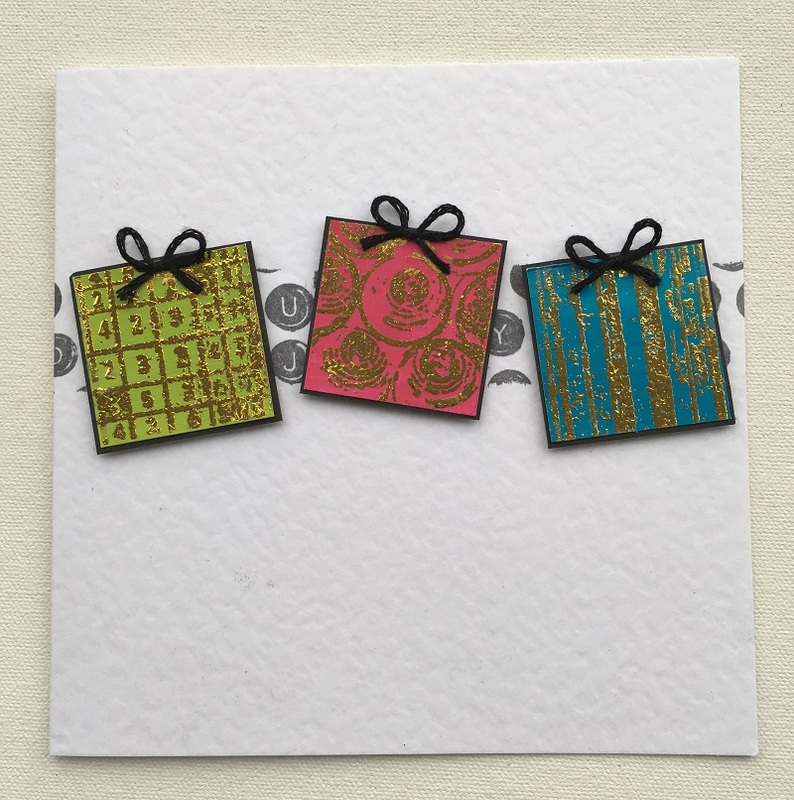 Love your use of foil along with Seth's stamps. Very inspirational. Amazing dear Ruth, wonderful modernistic cards, and the foiling is stunning . These are absolutely glorious, Ruth, I'm blown away by them, well done! This is soooo beautiful and fun. Love the graphic nature and your dimensional layering. Thanks too for using my stamps.